Maria Colvin is a native of Mexico and an immigrant to the U.S. who has moved back and forth across the border between the two countries for years. Over that time she has lived and worked as a house cleaner, near the bottom of a social ladder where 40 million Americans are often caught in a never-ending cycle of poverty. A slender woman, Colvin looks fragile but has deep reserves of strength. She's still near the bottom of the wage-slave abyss but she's not alone in her struggle. She's with the "Resisterhood," a nationwide movement made up largely of Latinos who are fighting back against deportations and exploitation on the job—not to mention all the other injustices that characterize the Latino immigrant experience in America these days. Colvin says the key to her awakening into activism was unearthing her pain and suffering, telling her story to empathetic listeners and forgiving herself for not knowing what to do when she felt trapped. "I cleaned house for a family every day," she says though an interpreter, as we all sit in the sun in front of the Arlene Francis Center in Santa Rosa, where domestic workers often meet. "I cooked, I cared for a baby, and sometimes I was not paid. Finally, after talking with a cousin I realized that I was a victim of manipulation and the bad environment in the house where I lived and worked." She looks up from the paper that has her story, and adds, "I am speaking today, despite my shyness, despite my insecurity and my trauma because I have learned that there are thousands of women like me in California who don't speak English, don't know their rights and are afraid to sue the people who exploited them." According to Christy Lubin, director at the Graton Day Labor Center (GDLC), house cleaners are often overworked, underpaid and often at risk when using toxic chemicals to scrub tubs, sinks and toilets, and clean in places many don't want to go. 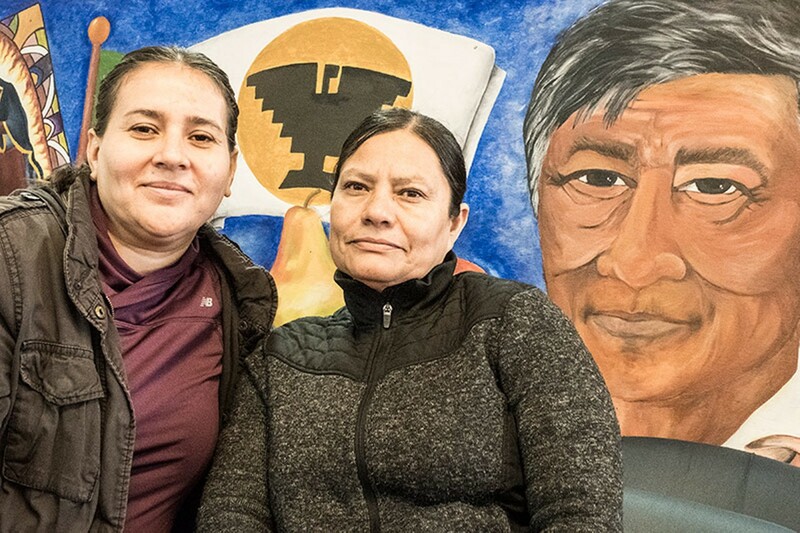 In Sonoma County they have rallied under the banner of "the Resisterhood," and they're backed by the Graton Day Labor Center (GDLC), which has helped improve the lot of house cleaners as well as field workers since it was founded more than 15 years ago. Domestic workers in Sonoma County have emerged from behind closed doors over the past decade, more than ever before. They are speaking in public about their own lives and the conditions under which they labor. Legislation has helped. In 2013, State Assemblyman Tom Ammiano championed the California Domestic Workers Bill of Rights. Three years later, in 2016, the California Domestic Worker Coalition (CDWC) and members of ALMAS celebrated former Gov. Jerry Brown's signing of a Bill of Rights, which gave permanent overtime protections to domestic workers—though not wage guarantees. Immigrant domestic workers earn close to minimum wage without basic labor protections that many take for granted. Lubin says domestic workers in Sonoma County make between $17,000 and $25,000 a year. "That's nowhere near a living wage," she says. The Graton center is home to the Alianza Laboral de Mujeres Activas y Solidarias (ALMAS), a new organizing project for domestic workers. The organization is less a union than an alliance of politically active women. "We do the work that makes all other work possible, and relaxation, too, so people can come home and not have to clean and wash," says ALMAS leader Socorro Diaz. "I tell women they have rights, that they shouldn't hide and don't be afraid to work hard and live life the way you want it. If you need help I will show you how to be a professional house cleaner." It's hard to imagine a house cleaner and domestic worker with more pride, self-confidence and inner beauty than Diaz, though those traits didn't come easily. She acquired them through struggle and solidarity with other women. Diaz, who is married with three children, has worked as a house cleaner and a nanny for 14 years. She's been sexually harassed, she says, and one boss tried to intimidate her into working overtime without pay. Employers could discriminate against her because she was an immigrant, a woman and also simply because she was a domestic worker. The Trump administration's attacks on immigrants, she says, shocked her, inhibited her, and made her feel more afraid. Finally, it was all too much. She went to the GDLC, attended workshops, and educated herself about her basic rights as a woman, a worker and as a human being. "I found out my rights to my lunch break, my meal and to be paid overtime if and when I worked more than eight hours," she says. "Now I know my rights as an immigrant worker and I feel safer knowing I'm supported by the law." She adds, "I want our work to be valued as an important pillar for the health, well-being and peace of all households and families in this country." Alfonso Cuarón's Roma, which portrays the life of a domestic worker in Mexico (and won an Oscar for best director at the 2019 Academy Awards), has served to inspire house cleaners and nannies like Diaz who live and work in Sonoma County. "Roma tells our story," she says. "We're expected to move about the houses we clean without making a sound and without being seen." And if the house cleaner dares to speak up? Not long ago, Diaz explained to an employer that she was bringing her children from Mexico to the U.S. and couldn't work the same number of hours she had been working as a nanny and house cleaner. She was told, "That's unacceptable." In her case and in many others, there's little if any room to negotiate with employers. Domestic work in the U.S. is never-ending. There's always another load of laundry to wash, dry and fold, a carpet to vacuum, a floor to sweep. The workday often runs to twelve hours, especially when domestic workers double as nannies. Children have to be put to bed and roused the next morning, then clothed, fed and sent off to school. Domestic workers are also employed as caregivers and personal assistants; sometimes they perform three jobs for the same family in the same house. In Sonoma County, the ranks of immigrant house cleaners have grown sharply as demographics have changed. With older and more affluent folks and a soaring tourist industry, the demand for domestic workers has intensified. "Jobs are especially hard with vacation rentals in private homes," says a Latina woman who does a lot of cleaning of homes rented on Airbnb. "Guests are always going and coming, which means there's a small window of opportunity to clean, and so everything is speeded up. I recently had to ready a place for 30 guests." While not all immigrant domestic workers are undocumented, many are. And many have homes, husbands and children of their own. Some have left children behind with family members in their home countries, and send monthly remittances to cover their expenses. In the local Resisterhood, the women age 20 to 50 and come from Guadalajara, Mexico City, Tijuana and other cities in Mexico and Central America. Barbara Ehrenreich, the author of Nickel and Dimed, has written that many domestic workers in the U.S. toil under conditions "indistinguishable from slavery," where "affluent employers live in intimate dependency on people who are poorer than themselves." Progressive-leaning lawmakers are taking note. U.S. Senator and presidential candidate Kamala Harris recently introduced a Federal Domestic Workers Bill of Rights that would embrace the rights that house cleaners already enjoy in California and in seven other states. The legislation would create a retirement savings plan funded by employers. It would offer workers affordable health insurance and create training and development programs. It would also create a commission that would police the industry and make sure that employers complied with the rules. All this is long overdue, says the GDLC's Lubi. She says domestic workers in Sonoma County often work "without contracts, either written or oral, and without breaks, or overtime pay after eight hours of work." Industry analysts estimate that nationwide, wage theft adds up to $105 billion in unpaid labor per year. Sonoma County ALMAS leaders have launched a Fair Work/Clean Homes campaign, which aims to educate house cleaners about their rights. The campaign also supports the workers when they have been the victims of wage theft. Another goal is to educate employers and to identify the "bad actors" who are, in some cases, other domestic workers who hire women to work with them, pay below minimum wage and when they work more than eight hours a day, don't pay overtime. "We're not a union," Lubin says. "But we're like a union in that our goal is for house cleaners to set the wages and conditions for the work they do." Maria Colvin is older than most of the domestic workers in Sonoma County, but her age doesn't prevent her from doing a hard day's work. As a spokesperson for the CDWC, Colvin calls for basic rights "so that other women won't have to face the exploitation and abuse I experienced as a housekeeper and nanny. "I worked in hotels and restaurants in Mexico before I came to the United States," she adds. "That experience helped me find a job here. When my husband died suddenly, I lost my home and didn't have a way to support myself. I found a live-in job with a family. I spoke no English. I didn't know I had rights. I thought that the people who hired me were doing me a favor by giving me this job. I worked five days a week from 8am until 8pm. I slept in the same room as the two little children I cared for. I was paid $120 a week. That's $2 an hour." Diaz adds, "The difference between my life and the lives of the people I work for is unbelievable. I want enough; they have everything. They travel, eat in expensive restaurants, buy new cars and fancy shoes." Colvin nods and says, "We live in two different worlds."